Learn more about Bathroom Lighting by Watching a Video! What types of bathroom lighting are available and what are the features of your collection? Bathroom lighting is one aspect that is often neglected during interior home or office designing. However, selecting the right lighting fixtures for the bathroom is important as it can not only brighten up space but also flatter the overall décor of the place. For the most part, bathroom lighting consists of ceiling lights, mirror lighting from the side, mirror lighting from the top, and vanity mirror lighting. Well-placed bathroom lights can provide glare-free lighting for shaving or put on makeup. That’s why it is important that you select the perfect light for your bathroom. What brands would you recommend for modern bathroom lighting ? 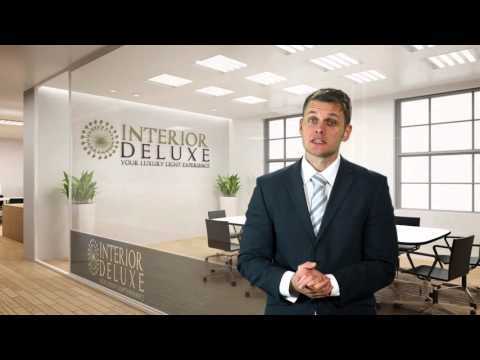 At Interior Deluxe, we understand the importance of high-quality lighting for the bathroom. That’s why we stock only branded bathroom lighting with a primary focus on functionality and design. Here you can find branded bathroom light made by such well-known brands as Artemide, Estiluz, Vistosi, Helestra, Sonneman, and Flos. Our premium quality bathroom lights are available in multiple design and styles. You can find both modern and transitional style lighting fixture for your bathroom. These lighting fixtures can transform the bathroom in the home or office into a soothing retreat. What are the different styles of bathroom lighting and can you show me any samples of your most popular products ? One of the most popular modern bathroom lighting fixtures is the Sunrise wall sconce from Morosini. This high-quality bathroom lighting fixture features satin-finished stainless steel. The fixture comes in white, black, and satin colors that you can select to match the décor of the bathroom. The Giglio Wall Sconce from Vistosi is yet another stylish modern bathroom light that boasts a fantastic design. This lighting fixture is manufactured using piastra glass with textured surface decoration in a crystal diffuser. Available in two sizes, the light fixture can enhance the look of any modern themed bathroom. A bathroom wall light that manages to pull off the perfect fusion of style and elegance is the Cadmo Wall Sconce from Artemide. The modern design wall sconce is available in red, black, or white painted finish. Designed by Karim Rashid, the interior of the wall sconce is features a white painted finish. Spotlights also help in enhancing the ambiance of the bathroom. Damasco Spotlight from Vistosi, for instance, is perfect for an illuminated bathroom. Light is created using a unique Bozzolo technique where threads of molded glass are manually applied in a pre-shaped element. The Andromeda ceiling light from Marchetti is a modern design bathroom light that looks simply spectacular. The circular shaped ceiling light uses Italian square crystals and is made using high technology system to ensure excellent brightness. Transitional design bathroom lights complement a broad range of décor choices. They represent a fusion of classic and contemporary design and add distinguished grace to space. Two best examples of transitional design bathroom lights include Scotch 0960-01 light and Millennium 8091 light from Vibia. The Scotch 0960-01 Wall/Ceiling light features a minimalistic design that can be mounted both on walls and ceiling. Designed by Oscar & Sergi Devesa, the light boasts a chrome finish and features a white glass diffuser. Another great lighting fixture is the Millenium 8091 Wall/ Bathroom Light. This elegant designed light looks great both in the bathroom area and over the vanity mirror. It was designed by Ramos and Bassols and serves as a perfect additional to any contemporary home. Mirror lighting from the side is one of the most popular bathroom lighting fixtures. Our extension and the unique collection consists of a variety of size, design, and brand lighting that can be the perfect addition to a modern bathroom. The best example of mirror lighting from the side that features stained open glass is the Pablo Wall Sconce from Helestra. This exclusively designed wall sconce is in the shape of a pearl that significantly adds to the elegance of the home. Anyone that has a sophisticated taste will love this beautifully shaped side lighting fixture. The A-8070 wall sconce, designed by Leonardo Marelli for the Estiluz brand, is one of the best mirror lights out there and features a metallic nickel finishing as well as a white opal satin glass. The wall sconce features an elegant design that provides spectacular illumination. Prefer something along the lines of the extraordinary? The Lio thin wall sconce from Vistosi can be the perfect choice for you. The lighting fixture is created using unique technique that allows modeling white glass band into multiple layers of crystal. It creates a beautiful glow of light that adds opulence and class to any home décor. Vanity mirror light is ideal to be fitted above mirrors in the bathroom. A classic example of simple and elegant vanity mirror light is the Vanity Slim LED Bath Bar from Sonneman. This light fixture feature bright and even LED illumination in a compact form. The slim version of the light can be mounted flush against a mirror or in a tight alcove. Box 80 Wall Sconces and Box 120 Wall Sconce from Decor Walther are great vanity mirror lighting fixtures as well. These lights are available in satin nickel and chrome finishing. A matt glass diffuser that is present in front of the bulb ensures even distribution of light. Both of these vanity mirrors has been designed by the iconic In House Design for Decor Walther. The cuboid-shaped mirror lamps are ideally suited for modern home décor, lending a sophisticated charm to the place. Still not sure which Bathroom Lighting to buy? Call us today on +1-866-477-1345 and our ALA certified lighting experts would provide you with inspirations and guide you through the process! Whether you’re looking to accent your washroom with decorative wall sconces, illuminate the space with a bright and bold ceiling fixture, or add display lighting to highlight artwork or architectural features, we have the elegant lighting solutions you desire. Good light plays a key role in a bathroom. You need warm, ambient illumination to create the right space.